Only Indian female chef ever to compete on Iron Chef. 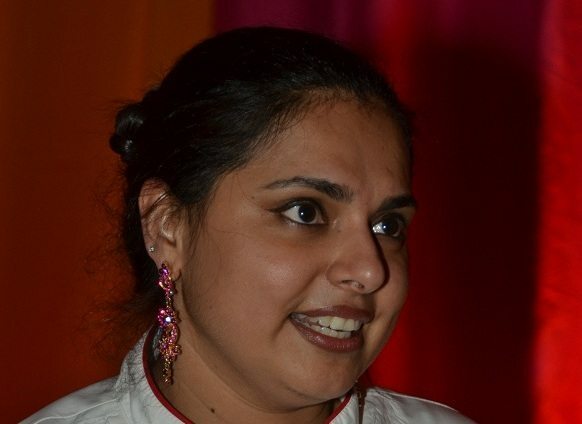 WASHINGTON, DC: Celebrity chef Maneet Chauhan started her career in India, working at top notch hotels and kitchens like the Taj Group, Oberoi Hotels and Le Meridian, before she left for the US to attend The Culinary Institute of America. She made a name for herself as the Executive Chef of Vermilion in Chicago, and its Indian-Latin cuisine earned many accolades, including Chicago MagazineвЂ™s Best New Restaurant, EsquireвЂ™s Restaurant of the Month and Wine EnthusiastвЂ™s Best New Restaurant in the U.S awards. When it branched out to Manhattan, Chauhan was nominated as the вЂBest Import to New YorkвЂ™ by Time Out Magazine. After eight years of leading the kitchens of Vermilion in both New York City and Chicago, Chauhan ventured out on her own and founded Indie Culinaire, an avant garde culinary and hospitality company. In a short period of time she has established herself as an honorary figure and a leading volunteer for prestigious culinary schools, industry events and premier non-profit foundations. After being the only Indian female ever to compete on Iron Chef and a fierce competitor on The Next Iron Chef, Chauhan is now a full-time judge on the Food Network hit show, Chopped which has been nominated for a CriticвЂ™s Choice Award and granted Chauhan the honor of receiving the prestigious James Beard Award of Excellence. She has also appeared as a guest on ABCвЂ™s The View on how to cook Indian food. A highlight of her career was when she was chosen as the only chef to cook at the first ever Indiaspora Inaugural Ball, honoring the re-election of President Barack Obama. She has also received recognition of вЂњDistinguished Service to the Foodservice and Hospitality IndustryвЂќ as the Ambassador of the Culinary Institute of America. She is currently in the process of opening a restaurant in Nashville, Tennessee, planning a book signing tour for her new book across the country, and developing a signature spice line. How was your experience as a contestant on Iron Chef? The level of competition on Iron Chef was very intense. In fact, I feel like the show provides chefs with a stamp of approval and in many ways lets them know that вЂњtheyвЂ™ve arrivedвЂќ. It was a tough journey to say the least but in the end it provided me with an example how hard work and persistence pays off. What made you want to make the transition from full time chef to television celebrity? It comes down to the awareness factor. When I was in India, I felt like being a full time chef was a very unique career path. It was quite the contrast from the traditional fields like engineering and medicine and not necessarily considered a full time profession. Times have changed, and today because of chefs on television, the public has come to accept that being a chef neednвЂ™t be just a hobby but can be a full time career. ItвЂ™s for that reason, I love being on television and enjoy being able to continue spreading the message about the importance of pursuing oneвЂ™s passion towards a full time career. On another note, I love being the voice in mainstream America for Indian food. I absolutely love Indian food and spices but believe it still has a bad rap in America and hasnвЂ™t reached the level of acceptability like it has in the UK. I want to do my part to change that. You tend to see more male judges on cooking shows. Considering that, do you think the culinary world is male dominated? Definitely. No questions about it. ItвЂ™s a very difficult industry and extremely hard to balance with other commitments in oneвЂ™s life. This being said, there are more amazing female chefs who are coming to the forefront. Considering you are a judge on Chopped, do you feel family and friends are intimidated to cook for you? (Laughs) Great question! Home cooked food is totally different story from what we saw on the show. There is so much more than ingredients that go into home cooking. A home cooked meal includes so much love and recipes that have been passed down through generations and that is what I truly appreciate. My family and friends know that when I go to their place for dinner, I go to enjoy whatever they have prepared rather than judge anything. That being said, I do have some friends who get intimated to cook for me, but that can all be taken care of with a couple of glasses of wine! What are some of your Indian favorite dishes to eat and prepare? I donвЂ™t have a favorite specific dish but absolutely love the street /вЂњdhabaвЂќ food. While I appreciate what goes into making high-end Indian dishes, street food has a special place in my heart. Being raised in India, street food played an integral part in my life while growing up. ItвЂ™s amazing how these meals can be executed to perfection in such a basic kitchen. From a preparation perspective, I enjoy preparing dishes which are not commonly found in traditional Indian cuisine. What do you think of fusion food? I love fusion Food and its close to my heart. I believe food is like life itself and all about evolution. While one can emulate a dish thatвЂ™s already been established, itвЂ™s those chefs constantly innovate and recreate new combinations of dishes that set themselves apart. Tell us about your new restaurant which you are opening in Nashville? The restaurant will be a gastro pub and micro-brewery with an Indian flair. Rather than pairing wines with Indian food, which I donвЂ™t believe is a natural combination, we are going to focus on leveraging beers which is prevalent in India with Indian food. ItвЂ™s not going to be a stuffy place but rather a place where anyone can come and relax to enjoy some beer with tapas that have an Indian flair. Do you attribute the increase in Indian chefs on television to the overall growth in public demand for Indian food? Definitely. There is a public intrigue with Indian food in America. Because of competition, Indian restaurants have had to get out of a so called time warp and a secular like cuisine to a focus on being more passionate about what they are putting in front of their customers. So considering all that youвЂ™ve accomplished, whatвЂ™s next for Maneet Chauhan? I just wrote a book called Flavors of My World, which is very dear to my heart. ItвЂ™s about my favorite dishes and drinks from 25 countries around the world presented with an Indian twist. IвЂ™m also working on a spice line which will be coming out soon. In addition, there is a knife company IвЂ™m working with to come out with my own line of knives. Hopefully there will be more television and another book in my future!